You know how Brandon Phillips gets booed at Busch Stadium? This guy can expect worse. 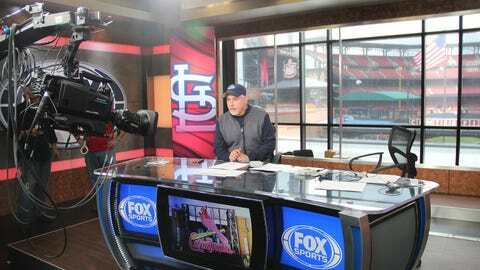 ST. LOUIS — There is no question the Cardinals will enter 2014 as heavy favorites to win the NL Central. They have the deepest lineup, strongest rotation and two of the game’s most exciting young arms anchoring the bullpen in Trevor Rosenthal and Carlos Martinez. Questions, however, abound around the rest of the division. So many, in fact, that we figured we would answer some of them and let you figure out the question, Jeopardy!-style. Answer: Aroldis Chapman, Skip Schumaker, Jonathan Broxton, Sean Marshall, Mat Latos, Homer Bailey, Jack Hannahan and Devin Mesoraco. Question: Who are Reds players who could begin the season on the disabled list? Chapman (head), Latos (knee), Schumaker (shoulder), Broxton (forearm), Marshall (shoulder) and Hannahan (labrum) are certainties. Mesoraco (oblique) is an almost certainty. Bailey (groin) is scheduled to pitch in an exhibition Saturday and, barring a setback, will be good to go for the third game of the opening series against St. Louis. Latos could debut in mid-April, which would give him most of the season but means he’d miss the first two series against the Cardinals. Question: Who will surpass Brandon Phillips as the most booed player at Busch Stadium in 2014? PEDs trump a sassy attitude. 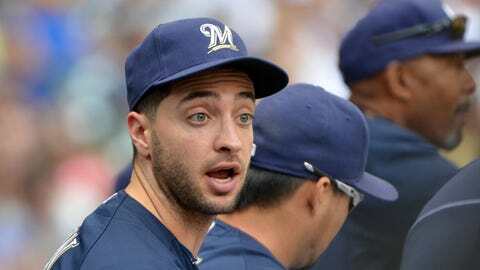 Heckling Braun, however, might be tempered in St. Louis because of the Cardinals’ new shortstop. Question: Not including Jhonny Peralta, who was the division’s biggest offseason acquisition? The NL Central didn’t exactly enjoy a spending spree in the offseason. The four-year, $50 million deal the Brewers gave Garza proved the largest expenditure of the winter besides the Cardinals’ four-year, $52 million deal with their new shortstop. Question: Which team is best set to rise in the standings? Adding Garza deepens the Brewers’ rotation, but what figures to help them more is the return of Braun. If he hits up to his career numbers, the Brewers will have as strong a top half of the batting order as any team in the division with Carlos Gomez, Jean Segura and Aramis Ramirez, the true Cardinals killer, surrounding Braun. Question: What do you call the Pirates’ offseason? After a breakout 2013, the Pirates lost more off their roster than they gained. Considerably more. Three players who were big down the stretch last year — A.J. Burnett, Marlon Byrd and Justin Morneau — are gone. They added only one player on a major-league contract: right-hander Edinson Volquez, who presumably will assume Burnett’s spot in the rotation. The Pirates also are hoping Wandy Rodriguez will be healthy and give them something for his $14 million option. Pittsburgh’s top offseason acquisition appears to be first baseman Travis Ishikawa, who was signed to a minor-league deal. The left-handed-hitting Ishikawa is expected to platoon with Gaby Sanchez, who was reduced to a backup role last year after the arrival of Morneau. The Pirates are stocked with up-and-coming players and pitchers, and they still boast arguably the division’s strongest bullpen. They can seek reinforcements before the trade deadline, too. But don’t be surprised if they end up regretting not adding a proven bat over the winter. Question: Where will the Cubs finish for the fifth consecutive season? As much as the Cardinals are favored to win the Central, the Cubs are an even safer choice to bring up the rear. Just check their roster. They have no one in their outfield who could start for the Cardinals (or Reds or Brewers). Their two best players, shortstop Starlin Castro and first baseman Anthony Rizzo, are coming off disappointing seasons. Their rotation is thin and their closer is Jose Veras, which says all you need to know about the bullpen. Of course, this is only year three of the Theo Epstein regime, and he has maintained a five-year plan would be needed to right the ways at Wrigley. Considering the Cardinals are built to last and the window for the Pirates and Reds remains wide open, the Cubs have a long way to go. Question: Who holds the key to the Reds’ success? The Cardinals aren’t the only contender plugging a rookie into a key spot. The Reds are counting even more on Hamilton as he will start the season leading off and playing center field, responsibilities handled quite well last season by Shin-Soo Choo. Like the Cardinals brought in Mark Ellis to provide insurance in case Kolten Wong falters, the Reds signed Schumaker to help out in center field. That figures to take a while, though, with Schumaker expected to miss at least a month after dislocating his left shoulder this week.